Review: A sixteen-year-old boy who is invisible and likes it that way is thrown into the most unlikely situation when his mother is struck down by a truck and he is left to the "care" of his unknown father in Rotters by Daniel Kraus. Imagine the most dysfunctional father, the most horrendous school, and the most bizarre people, and there you have this chilling coming-of-age novel. Joey's Crouch is a relatively normal straight-A kid living with his single mom in Chicago. He keeps to his trumpet, his studies, and his one friend. It's not much of a life, but it's enough for Joey. But, one afternoon the worst happens - his mother is hit by a truck. Before long, Joey's life is turned upside down. He must leave the city he calls home and head to rural Iowa to live with the father he's never known. As if that's not bad enough, when Joey arrives, he is not welcomed by anyone. He must find his way to his new home - which is empty - and new school - which is worse than he could ever imagine. Joey quickly finds he must make it on his own. It doesn't take Joey long to realize that something just isn't quite right. Aside from the fact that his father is never home, the dilapidated home reeks and he has no food, bed, or clean clothes. Joey is tormented by not only kids, but also teachers at his new school. Plus, his one and only friend in Chicago wants to move on - without Joey. When Joey realizes what his father really does for a living, he begins the most horrific training ever so he can follow in his father's footsteps and be the best grave robber ever. Daniel Kraus has woven together a tale of adolescence, a tale of grave-robbing, and a tale of death in Rotters. Joey Crouch is a relatively typical adolescent. He's smart, talented, and desperately in search of an identity. His character could easily be used in a study of adolescent development and how adversity can mold a person. It is maddening how such a turn of events can take a boy with such potential and turn him to a life of crime. Desperate for that identity, he finds it among the grave robbers - and ultimately from the most unstable robber of them all. Watching Joey evolve as a character is not only fascinating, but also frightening. The unlikely subject of grave-robbing adds an interesting twist to the story. What a horrible "profession". If nothing else, readers of Rotters will be sure to plan their burial well! It appears to be a sickening, though lucrative career. Finally, Kraus deals with death with a poetic prose that sends chills down the reader's spine. When Joey is left on his own he recalls the last time he was alone - when he stood above his mother's open casket and saw a spider. Kraus wrote, "I thought again of the spider that had watched her from the funeral home ceiling. I imagine it swinging down on gossamer and catching a lucky breeze. I saw it dancing over her folded hands, racing past her necklace, and defying gravity to scale her upturned chin before disappearing inside her, where it would live out its life." Clearly, readers with weak stomachs should stay clear of Rotters! But those readers who enjoy the morose will find Rotters an interesting read. Though it does not entrance the reader, it does build up enough suspense and is just enough unsettling to make readers keep turning pages until they reach the end. We would like to thank Random House for providing a copy of Rotters for this review. 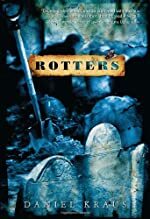 Have you read Rotters? How would you rate it?